Hi there everyone! Donna here today as your host, and I have a bit of a mixed-up post for you today. Even though it's been two months since CHA, I still haven't had a chance to share my projects with you here on the blog. I love everything that Simple Stories designs, but the two main collections released this past season, A Charmed Life and Homespun are definitely up there among my favorites. Layered clovers... might be my new favorite shape. Love the mix of kelly green and navy in this collection. I made another card for the show using Homespun, and the chipboard pieces from that collection. As soon as I saw that little bicycle I knew I wanted to feature it on a card. Some of you may not know that I am a huge fan of sketches and have actually written two eBooks all about them, Stretch Your Sketches and Stretch Your Sketches 2. The first eBook covers one-photo to seven-photo designs, while the sequel covers 8-photo through 20-photo designs. These little pre-cut squares make it so easy and fun to create your own customized patterned paper grid. 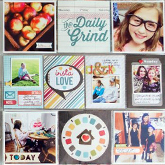 Speaking of hodgepodge, grids are such a great way to fit a lot of otherwise mixed-up photos onto a page. This next layout wasn't made for the show, but I want to share it with you today. You see, until recently I still hadn't scrapbooked any of our past Christmas photos and really wanted to make something before too much time passed. I used December Documented's Simple Basics Kit as the foundation for my page. You're probably getting tired of me saying it, but I love the Simple Basics packs. I think the chalkboard background worked really well here since it is fairly neutral. With all the busyness in the photos I wanted to keep the rest of the layout rather simple. I took a few highlight photos from the season and created a photo grid on an 8x10, added my title and finished with some very simple embellishments. It didn't take me very long at all to put together and now we have at least one layout documenting our Christmas. That's what my grandma used to call, "a good deal." Thank you all for stopping by, and for letting me share my creations with you today! Wow!! These are all gorgeous! LOVING the colors and loveeeee that shamrock on the first card!!!!! These layouts are gorgeous. I LOVE Simple Stories!!! !